In the World that Jamaica Made: The Nicholas Da Silva Story | Kam-Au Amen & Co. There are times I think that I should have named this blog, “In the world that Jamaica made”. I say this because on my journey I have encountered so many great non-Jamaicans who are so versed in and passionate about the culture of Jamaica. The output of the collective Jamaican “kingdom of the mind” is an enviable possession that we too often take for granted; with local shenanigans being nothing but bold displays of a lack of vision and a sense of self (history). On March 1, Brazilian born Nicholas Da Silva reached out to me after reading my last post about his Jamaican inspired comics Dread & Alive. We chatted about his project, and I took from him great inspiration and hope for the Jamaican culture, all of which he became familiar with through friends, books, films, music and a singular visit. He is living testament to the world that Jamaica made. His story is inspiring and I said to him that I wanted to tell it. Thankfully, he agreed to have me take some text from our exchange for this post. Have a read and learn about this remarkable artist who is more attuned to and passionate about Jamaica than many Jamaicans I know. He is a man with a purpose and a vision, and somehow I think he will be successful at fulfilling his purpose and attaining his vision. Kam-Au Amen (KA): So how did you even think of this project? Nicholas Da Silva (ND): Well, when I was 22 my father passed away, he was my hero, he showed me the world before I even started high school. KA: Was he connected in to the Maroons [of Jamaica]? ND: No, but he was adamant about being independent, and a history buff, he loved knowledge and believed knowledge was power. I can still hear him telling me that if you want to learn something, go to the library, it's a place of knowledge. So I went home to the funeral, and then returned to San Francisco where I worked during the day and also worked a nightclub for reggae nights. My bouncer was a Rastafarian who really helped me get through the pain of losing someone very close to you. I found refuge in reggae music and that began to pique my interest in the country of Jamaica; this is back in 1989. 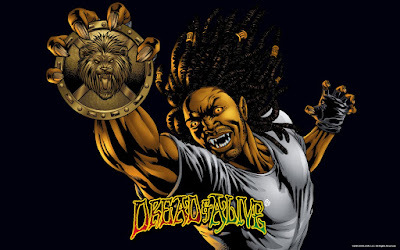 KA: I noticed that Rastafarian characters and the [Dread] talk feature in a few of your projects. ND: Yes, I try to always give thanks and praise to those who influence me. KA: I actually wondered if you were Rastafarian. ND: I’m not a Rastafarian but I have so much respect for Rastafarians. KA: In many ways tapping into Rastafari is tapping into the essence of Jamaican culture. ND: Yes indeed. You know, the one thing that really spoke to me about the history of Jamaica was the Maroons. Here, you have a group of people who wanted their freedom and would fight by any means necessary to protect that freedom. I told myself a story must be made and told to future children to show them the plight of freedom. [So] I set out to write Dread & Alive. KA: You tapped into a great medium to tell the story too. ND: Thank you, my friend! When I produce things, I like to mesh cultural fact with fiction. KA: How many issues do you envision for the series? ND: A lot. I want to have this story as a mainstream story that we can all feel proud of, inspire others and show them the path. KA: I agree. For my whole academic life that is the point of view I’ve been articulating. ND: I’m tired of the boring stuff I see in the US with the movie industry and how Marvel and DC [comics] depict us, we can be heroes too. Your article really touched me. From the heart. That's why I reached out to say hello. ND: I’m going to be releasing issue #2 this month, and have already drawn issue #3, it just needs to be colored and lettered. KA: The music on the website is original, right? ND: Yes indeed, I’m doing a CD series too. KA: Is it just your music only? ND: No, I’m inviting others to join me, I have the first CD line up ready, and I am looking for CD #2. KA: From the Adobe article I read on you I could see that you are a [workaholic], you hardly take a break, I admire that. ND: Thank you! I love the arts, music, writing, and drawing. I think I sleep 5 hours every day (7 actually); but I always wake up refreshed and ready to create. KA: How are the sales on Panelfly, [the iPhone/iPod comic downloading service]? ND: I don't know because I just joined them. We will get the first reports next month; the issue is #8 on the top ten which is a good thing. KA: Is the print uptake good? ND: Yes, it is. I’m producing this project totally independent, and loving every minute of it. KA: Do you think this will do well in Japan? ND: I think so, I get a lot of traffic there, and I have a nice following through ZOOLOOK. KA: What is your overall vision, do you see a TV series perhaps? ND: I would like to see a movie produced based on the stories, and a TV series, animated and live action, I’m open to both. If you noticed on the site, I have 2 stories. KA: This is such an inspiration. So how did the link with HELP Jamaica! come about? ND: I was looking for an organization that was trying to make a difference, one that is close to me. I told my dad that one day, I would build a library in his name. I believe he is with me in spirit. I have to tell you, I do get tired of having the wrong role models forced on the kids who will be our future. Sports can only take us so far. With the mind, the journey is endless, and that’s why I do this. KA: [You mentioned in the email to me that you are getting the comics translated into Patwa.] Its great that you reached out to the folks at the University of the West Indies. How is that going? ND: [Professor Hubert Devonish and the Linguistics Team] are translating the comic book issues now. KA: I know I mentioned it in my note, but full translation would make it virtually incomprehensible to an English audience. ND: I know, but you know, I like that. ND: One of the things I will do is help Hubert Devonish; he is trying to make Jamaican Patwa an official language. I will join him and use the series to help him. ND: You know, there is one thing I want to share with you. I think it's sad that it takes a major catastrophe for people to come together to help those in need. We should do this every day. That's Drew McIntosh's moniker - everyday, I will fight the good fight to make the world a better place. KA: Thank you Nick for your time and allowing me to share this. I must say that after this discussion I was moved. Rare are the moments when you meet people and their spirit so energizes your own. I emerged from this chat with even greater conviction that the story of the world that Jamaica made needs to be told. It was also very clear to me that the army that will be summoned to tell it won’t all be recruits from the rock. Instead, they will come from among some of the good people we meet on our journey. Keep doing what you doing Nick for the love of Jamaica. Walk good, and good duppy walk wid yuh!